CAE and government partners unveiled plans to invest $1 billion over the next five years to innovate aviation training platforms. This includes primary funding for CAE’s new Project Digital Intelligence initiative, described by the company as a digital transformation project to develop next-generation training solutions for aviation, defence and security and healthcare. 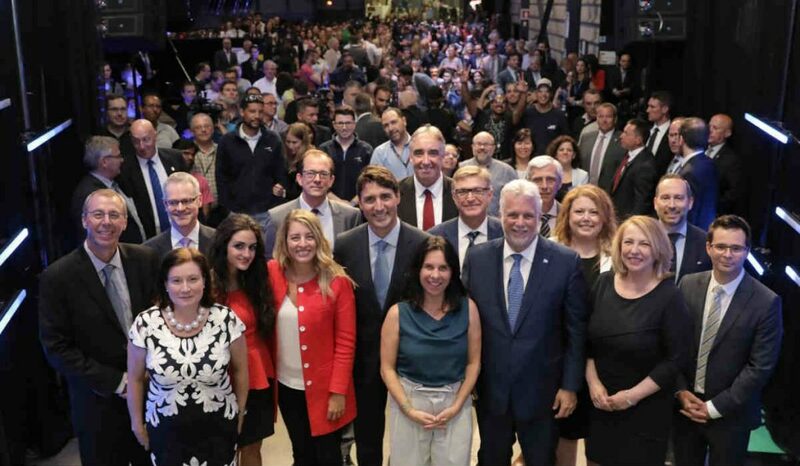 Canadian Prime Minister Justin Trudeau and Québec Premier Philippe Couillard joined CAE executives in Montréal yesterday afternoon to announce the investment plan, which includes partnership funding of $150 million from the Government of Canada and $50 million from the Government of Québec over five years. CAE notes this is one of the most-significant investments in innovation in the aviation training industry globally. The total $1 billion project is designed for CAE to continue to play a key role in making air travel safer, defence forces mission ready, and helping medical personnel save lives. CAE explains other benefits will include reducing aviation’s environmental footprint and addressing the worldwide demand for aircrews. “By seizing new technologies such as artificial intelligence, big data, or augmented reality, as well as many others, and applying them to the science of learning, we will revolutionize the training experience of pilots, aircrews and healthcare professionals, as well as improve safety,” said Marc Parent, president and CEO of CAE. In addition to the digital technologies and strategies mentioned by Parent, CAE explains Project Digital Intelligence will also leverage cloud-computing, cybersecurity and virtual reality tools. The project includes three major activity areas: Advanced digital technology development, digital transformation of the training and user experience, as well as CAE innovation and collaboration facilities. CAE plans to carry out Project Digital Intelligence in Canada, utilizing its R&D laboratories, as well as its test and integration facilities. As part of the project, CAE will develop an innovation campus in its Montréal site by transforming its workspaces, laboratories and processes to allow for greater innovation and collaboration. Throughout Project Digital Intelligence, CAE will co-develop technology solutions with small- and medium-sized companies from across Canada. It plans to qualify more than 150 new innovative suppliers across the country. CAE will also work with over 50 post-secondary institutions and research centres.